Jeroen Peeters (1976) was educated in art history and philosophy and is currently living and working in Brussels, as a writer, dramaturg and performer. He began writing on dance for the students weekly Veto in Leuven (October 1997 to May 1999). Right after graduation he started his professional life as a freelance dance critic for the Belgian newspaper Financieel-Economische Tijd (October 1999-May 2001), in which he covered the entire Belgian dance scene, by way of reviews, journalistic essays and interviews. From August 2003 to December 2005 he took up reviewing again for the Flemish daily De Morgen. Afterwards he changed his focus towards dramaturgy and artistic research, yet he continued writing essays and reviews on dance for media such as Corpus, Dance Theatre Journal, and Etcetera, of which he's been part of the editorial board (2008-14). Peeters furthermore co-edited books on the aesthetics of Jean-François Lyotard, queer theory, monstrosity and the performing arts collective Superamas. Since 2002, Jeroen Peeters has been part of the artistic team of Sarma, a laboratory for discursive practices and expanded publication. Recurring themes in Peeters' writings are the claim that dance is not a pictorial medium, the performing arts as a site for social experiments, and embodied knowledge. Next to dance and performance, Peeters writes about visual arts, jazz and film, as well as about art theory, aesthetics and topics with a wider resonance in society, such as sustainable development. Out of an anthropological interest in documenting the "languages of making", Peeters set up several dialogical projects with artists, which resulted a.o. in his book in collaboration with choreographer Meg Stuart, Are we here yet? (Les presses du réel, 2010). His research on spectatorship and dance as a critical force within visual regimes led to the book Through the Back: Situating Vision between Moving Bodies (TeaK, 2014). In collaboration with Jack Hauser and Sabina Holzer he made the artist book We don't know what free jazz is (WTKB Editions, 2015), a collective, improvised book on improvisation in the shape of a double LP. The essay Reseeding the Library, Gleaning Readership was published with Afternoon editions in 2018. Forthcoming is a monograph on Mette Edvardsen's work, Something Some Things Something Else (Varamo Press, 2018). Currently, Peeters is preparing a book on 'ecologies of attention' in literature and film. Peeters regularly engages in artistic collaborations with among others Julien Bruneau, deufert+plischke, Mette Edvardsen, Jack Hauser, Sabina Holzer, Heike Langsdorf, Martin Nachbar, Meg Stuart and Jozef Wouters. Collaborative performance works include Anarchiv #1: I am not a zombie (2009) with deufert+plischke and Marcus Steinweg; Die Unbändigen (2012) with Jack Hauser, Satu Herrala and Sabina Holzer. With Jozef Wouters he created The Metaphors (2015), a lecture performance on the use of text and image in the debate on climate change. Together with Martin Nachbar he made A Field Trip (Der Choreoturg) (2016), a fabulatory performance attempt to reforest the theatre. Atelier III and Projecting [Space[ (2017) are in situ creations with Meg Stuart/Damaged Goods and Jozef Wouters that seek to experiment with social and artistic places of encounter. In Fall 2012, Peeters receives the Dutch literary Award Pierre Bayle for his dance criticism. From the jury report: "De jury danskritiek bewondert de betrokkenheid, de hoge literaire kwaliteit en de kritische reflectie in het oeuvre van Jeroen Peeters. Op diepgravende en eloquente wijze weet hij dansvoorstellingen te duiden en in hun artistieke en maatschappelijke context te plaatsen. Zijn werk geeft blijk van een scherpe en analytische geest en gedegen kennis van de internationale dans en zijn esthetisch discours. In deze voor de kunsten moeilijke tijden heeft hij een eigen podium gecreëerd voor zijn kritieken, waarmee hij een belangrijke bijdrage levert aan de maatschappelijke legitimering van de dans als kunstdiscipline." Peeters' speech of acceptance can be read here. Over the years, Sarma collected a selection of Peeters' early reviews for Veto, as well as the whole body of texts written for Financieel-Economische Tijd and De Morgen, except for short announcements. This collection is supplemented with essays, programme texts, book reviews and an annotated selection of Afterwords, a critical project realised for the ImPulsTanz Festival in summer 2002. In May 2014, this collection was updated with several unpublished lectures, interviews and hard-to-find essays, resulting in an anthology that encompasses Peeters' complete critical writing on dance and performance, including many translations. It furthermore includes reviews of Peeters' book Are we here yet?. Several texts frame the collection. On the occasion of Sarma's launch in November 2002, Peeters wrote a poetics (in Dutch and English). Later on, this poetics was extended into a longer essay (in Dutch) and gave rise to a polemics among Dutch dance critics - 'Fantomen van de danskritiek' - documented in Sarma's collection What is contemporary dance?. In an essay for Thomas Lehmen's project Stationen (2004), Peeters reflected once again on the role of the newspaper critic (in English and Dutch). Lars Kwakkenbos wrote an essay about the main themes in Peeters' critical writings on dance (1998-2012), his poetics, the philosophical frames for his work and the development of his thinking in the proximity of dance (De hordes van een uitgestrekt denken, The hurdles of broad thinking). Special attention goes to texts that appeared only in Dutch. By way of introduction to his anthology, Peeters made a selection of his writings - 'A flower-gathering', which can be found below. Writing in May 2014, just before the launch of my book Through the Back and Sarma’s complementary online anthology of my critical writings on dance, I’m wondering where to start browsing in this by now vast accumulation of texts – how to guide new readers into the archive in ways I haven’t done before? A body of work in criticism is only partly a matter of planning: it involves a lot of commissioned work (for newspapers and journals), but also the negotiation of one’s own interests and agenda whilst surfing the opportunities offered by artworks, tendencies and media. I’ve been strategically appropriating and developing writing occasions from the very beginning, eager to work on a consistent voice and oeuvre as an art critic. Yet, often I have been taken by surprise as well, and it is perhaps these moments that prompted me in different directions and made me discover foreign desires, at first unrecognizable and spurred on by the oblique and the obtuse. Both ways are vital to my writing, and some texts in particular might indicate a tilting point or the emergence of new approaches or ideas. Some of these are introduced in this flower-gathering, which is, to be sure, arbitrary, reduced and in itself a fiction. In 1997 I started writing for the students weekly Veto during my studies in art history and philosophy in Leuven, mostly about visual arts and experimental music, but also about contemporary dance. After some early try-outs, my review of an improvisation on Bach’s Wohltemperiertes Klavier by Alexander Baervoets marks the beginning of my critical writing on dance. It’s the first text in which I trusted my own viewing experience as a basis for analysis, and it indeed launched a practice of reviewing dance on a regular basis. The pairing of intellectual rigour and an insistence on experience and medium-specificity in Baervoets’ revamped modernism attracts me to this day, and it was the perfect ground to develop my own obsessions around the temporality and embodied character of spectatorship. Rereading the review, I was surprised to discover how a few sentences of that text lingered on and ended up in my book Through the Back fifteen years later – speaking of projecting an oeuvre! Right after graduating I began to work as a dance critic for the Flemish daily Financieel-Economische Tijd, then a financial newspaper with cultural pages on Saturdays and the freely distributed cultural magazine Tijd Cultuur on Wednesdays – a status symbol that provided ample space for in-depth writing on art for a larger audience. I did cover the whole bandwidth of contemporary dance produced and presented in Belgium (yes, including coverage of the French community! ), by way of interviews and reviews that are characterised by a blend of long exploratory descriptions and philosophical interpretation. This interest in description has to some extent remained a hallmark of my critical practice, as it forces the writer to take the artwork and the situation it initiates as a point of departure for analysis – these concerns are discussed in the poetics (English, Dutch) I wrote in November 2002 on the occasion of Sarma’s launch. My writings for Financieel-Economische Tijd (October 1999-May 2001) coincided with a change of the dance field in Brussels: in 1998 and 1999 the first generations of P.A.R.T.S. graduated and started to make work (Salva Sanchis, Arco Renz, Tom Plischke, Riina Saastamoinen, Charlotte Vanden Eynde, Etienne Guilloteau…), just like young choreographers did that had worked as dancers for companies such as Rosas, Ultima Vez or Damaged Goods (Thomas Hauert, Heine Avdal and Yukiko Shinozaki, Sidi Larbi Cherkaoui…). Taken as a whole my writings from that time do provide an interesting document of an emerging scene – of which several people actually did not develop a successful career and are now largely forgotten. And, with hindsight, they are certainly also a trace of my changing taste and interest: reviews of Charlotte Vanden Eynde’s and Ugo Dehaes’ Lijfstof, Thomas Hauert’s Pop-Up Songbook or Jetzt, or Salva Sanchis’ GAP betray an understanding and appreciation of these artists that later on I lost interest in for various reasons. If Tijd Cultuur still incites nostalgia as the last beacon of newspaper criticism in Flanders, my reviews for the daily De Morgen (August 2003-December 2005) are certainly more mature: concise but rich in analysis, severe but righteous in their appreciation, and bearing a strong awareness of the institutional policies that governed the dance field, ready to actively intervene in it. That Elke Van Campenhout wrote for De Standaard and Pieter T’Jonck for De Tijd at that time, made for a lively interaction and critical debate that gave a flavour of how art criticism can or actually did create a public sphere. The many debates of that time around ‘conceptual dance’ and the state of criticism are covered in the Sarma collections What is contemporary dance? and Unfolding the Critical. That I had an influential voice as a critic, I experienced writing for De Morgen. The often despised system of star-ratings came in handy as a polemical tool – how to make efficient use of a five-star or one-star rating? Denouncing Jan Fabre’s Quando l’uomo principale è una donna as poor choreography (on top of bad taste and doubtful stance) has made the show only more popular, and discussing Pina Bausch’s repertory work Palermo Palermo as the cherishing of a myth that has long overtaken the actual work caused another storm in a tea cup. In a positive sense, my review of Raimund Hoghe’s masterpiece Sacre – The Rite of Spring with Lorenzo De Brabandere did contribute to history. Whilst finalising my review of the opening night in January 2004, the artistic director of the Kaaitheater (Johan Reyniers) called me on that Sunday afternoon to ask whether I thought the work had something at all – “Certainly a five-star review,” I replied. He: “Then we might as well risk programming the work again in two months.” To top it all, Karl Van den Broeck, chief of De Morgen’s cultural pages, would attend that performance, not quite believe his eyes and devote a full (!) page to the importance of contemporary dance and critical writing, stating that ‘from now on I blindly believe what our dance critic writes’ (in Dutch) – a somewhat absurd blend of sincere enthusiasm and provincialist humanism, but no less effective a gesture. It gave me license to write whatever I wanted for another two years (until Van den Broeck moved on to another medium, and populist editors with different aspirations started chopping away at the cultural pages – which was one of the reasons that made me leave newspaper writing as well.) Oh yes, Hoghe’s Sacre is still touring successfully. After leaving the newspaper, I focussed more on writing longer essays on artists and themes that I felt close to – often research in view of a book that would eventually become Through the Back. From 2007 through 2010 I continued writing reviews on a regular basis for the Flemish performing arts journal Etcetera and the online magazine corpus. I kept following the work of artists such as Philipp Gehmacher, Boris Charmatz or deufert&plischke, but also brought attention to artists that were hardly discussed elsewhere, such as Jennifer Lacey, Lila Mestre, Mette Edvardsen, Sara Manente or Thomas Lehmen. Often these reviews are small essays in themselves, carefully composed and exploring themes such as the use of scores or composing attention. One of these late reviews is the one I wrote on Eszter Salamon’s brilliant Dance for nothing (in English and Dutch), a text that was later included in André Lepecki’s anthology Dance – for me it still contains the germ of a larger essay on Salamon’s work that remains to be written. For all the scheming and dreaming that drives the development of my work, there is an essay I still like for being a marvellous loose end. Various new forms of documentary theatre came into being in the early noughties, leading to excitement, debate and new discourses. The 2004 edition of the KunstenFESTIVALdesArts in Brussels was a high point where many of these things came together. In the essay ‘Schimmenspel als herinneringsarbeid’ (‘Shadow play as a form of remembrance’) I discuss Olga de Soto’s wonderful Histoire(s) and works by Rabih Mroué and The Atlas Group, looking into the promise of documentary theatre to address issues of war, trauma, memory and mourning. Following certain artists over a longer period of time is the best way to gain a profound understanding of their work and how it develops – artists that are themselves consciously constructing a body of work have always attracted me for this reason. At the same time, without the right frame to select, observe and analyze these pieces, it is not possible to develop a larger perspective that exceeds the work. Sometimes this frame is offered through an assignment and yields unexpected results. When the Steirischer Herbst Festival asked me in the Summer of 2007 to write a text for their catalogue on the political potential of contemporary dance, I replied that in my understanding theatre and dance are communal media in the first place, and that their social potential is undervalued in discourse. Skimming through my writings, I came to mark ‘Living together on stage’ (in English and Arabic) as a major theme and started to work more actively on it. This brief essay led to a second and third episode, which all function as an introduction to my writings on the social and collaboration in the work of these artists elsewhere: Yvonne Rainer, Xavier Le Roy, Eszter Salamon and Christine De Smedt, Superamas, Meg Stuart, Laurent Chétouane, Boris Charmatz; but also Philipp Gehmacher, Vera Mantero, Jennifer Lacey and Nadia Lauro, and deufert&plischke, whose work is discussed in this vein in Through the Back. Collaborating as a dramaturge and performer on dance creations for about a decade now, I’ve been working my way through various themes, materials and interests offered by others. The many reading and viewing experiences during a process eventually lead to a piece, yet as a dramaturge and writer I’ve often developed side-projects parallel to these creations. One approach that became a form in itself is to use the various dramaturgical source materials for writing a text where they can resonate in a different way than on stage. An attention for heterogeneity and juxtaposition, for material and for the fiction to ‘let things speak for themselves’ are central in these essays that explore a collection of tropes. They also allow me to write about literature, film and philosophy in ways I wouldn’t do so easily in other contexts. An essay on monstrosity written in relation to Meg Stuart’s Replacement was later extended into a lecture – rummaging through a collection of materials has indeed also become a central strategy when I give lectures. The talking practice that is central to dramaturgy is perhaps captured in the audio-abecedarium ‘Animal Dramaturgies’, a counterpart to Martin Nachbar’s Animal Dances. At some point I also started to use this approach in an academic context, mobilizing materials and artistic practice to unsettle habits of knowledge production. An example is the essay ‘I am not a zombie’ – published here for the first time – that reflects on archiving in dance in relation to the piece Anarchiv #1 I made in 2009 with deufert&plischke and Marcus Steinweg. How do artists work? How do they speak about their practice? Discovering new vocabularies during workshops and studio visits, I’ve been wondering how the oral culture and the implicit, informal discourses accompanying the creation of dance, could be documented and given a more prominent place. This quasi-anthropological interest led to many dialogical projects with choreographers, most notably to the book Are we here yet? (Les presses du réel, 2010) in collaboration with Meg Stuart. I’ve been reviewing many books on and from practice, wrote about education and dramaturgy, challenged the dance world’s institutional obsession with ‘research’ and ‘knowledge’. The latter is formulated most clearly in ‘How do you want to work today?’ (English, German, Portuguese) on the eagerness of artists to capture speech during the German Dance Congress of 2006. 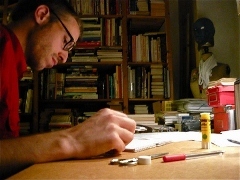 Writing a series of letters on film and practice to my friend Jack Hauser in 2010, opened up new desires: the direct address of one person resonates with the more informal intellectual dialogue among artistic collaborators in the studio, and it gives the anecdotal and the idiosyncratic a place. Ten letters are published as the series ‘Around the corner’ – which continues until new occasions for publication arise. When Mette Edvardsen asked me to write me about her piece Black, several interests developed over the years lingered on: the theme of composing attention, the use of literary materials and tropes, and also the first person account as a staging of self. Something to hold onto is a literary essay about books in the work of Mette Edvardsen, stilistically indebted to the writings of Enrique Vila-Matas. Written in English, it was also translated into Italian and Dutch. Parallel to my art criticism, over the years I’ve been reviewing books with a broader philosophical and cultural interest, on themes such as corporeality, urbanism and public space, mobility, participation, education, and sustainable development. These interests came at last more explicitly together with my writings on the performing arts when several cultural organisations in Flanders put sustainable development on the agenda as a concern for the artistic field. I think that the political impact of art is often overestimated and moreover misunderstood as a reduction of complex, ambiguous experiences to straightforward messages. However, in its reflexive attitude and profound, practical understanding of issues such as embodiment and collaboration, the performing arts might have something to offer in a transition towards a more just, resilient society and sustainable way of living. This much-discussed essay on the performing arts and sustainable development was written in January 2011 for a field analysis by the Flemish Theatre Institute and is avaible in English and Dutch.